How Thick Are Vinyl and Laminate Tiles? Vinyl and laminate tiles are durable, cost-effective and do not require much experience to install properly. The thickness of vinyl and laminate tiles is based on their construction while overall floor thickness is determined by installation methods. Tile thickness is determined by the tile and underlayment type. Vinyl tiles are typically manufactured out of plasticizers and polyvinyl chloride resins. The appearance of vinyl tiles can dramatically vary. In addition to standard solid-color versions, vinyl tiles are also available in marble, wood, and inlaid wood designs. The exact thickness of vinyl tiles depends on the layers of the tile. Vinyl tile comes in three primary types that include inlaid floor, printed vinyl and cushioned floor vinyl. 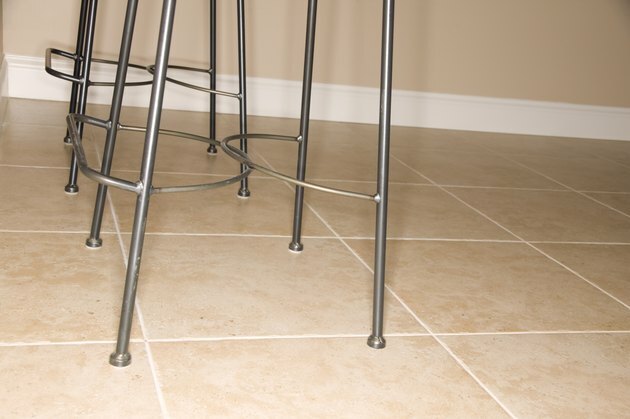 The cushioned floor vinyl tile has four layers: backing, cushioning, printed pattern and wear layer. The printed vinyl tile has three layers: backing, printed pattern and wear layer. The inlaid floor is the thinnest with only two layers: backing and inlaid patterns. The average thickness of vinyl tiles range from 3/32 of an inch to one-eighth of an inch. However, an eighth of an inch is the most common vinyl tile thickness. While laminate tiles are sold in a variety of designs, the hardwood design is most common. Laminate tiles are manufactured out of several materials that are bonded together by placing the materials under extreme pressure. Commonly, laminate tiles consist of high-density fiberboard, a high-resolution of a photograph image such as natural wood and a resin-cellulose coating. Laminate tiles typically feature a thickness of five-sixteenths of an inch to three-eighths of an inch. However, the exact thickness varies according to the layers and manufacturing process of the tiles. As with most other forms of flooring, vinyl and laminate tiles require an underlayment to prolong the life and integrity of the tile. An underlayment is different than a subfloor, as subfloors provide structural support while an underlayment creates a smooth surface upon which the tiles are installed. Plywood is typically used as an underlayment, and according to experts at Halex Corporation, plywood underlayment should measure between 6 and 9 millimeters thick. The addition of an underlayment adds to the overall thickness of flooring tiles. Because water can seep between vinyl and laminate tiles, add a moisture or vapor barrier sheet between the plywood and flooring materials. Moisture barrier sheets are typically manufactured out of polyethylene plastic, and the recommended thickness of such as barrier is 6 millimeters.